Lori Loughlin Photos, News, and Videos | Just Jared Jr.
Olivia Jade and her older sister Bella have decided not to return to the University of Southern California. The 19-year-old vlogger and her 20-year-old sister have withdrawn from college after their parents Lori Loughlin and Mossimo Giannulli were involved in the nationwide college admissions scam, TMZ reports. The girls have decided to drop out of school amid fears of being “viciously bullied” after their parents paid were both arrested this week after they were accused of paying $500,000 to get their daughters accepted into USC. It was also recently announced that Sephora had dropped their partnership with Olivia. Olivia and Bella are planning on “laying low” for now and don’t have any plans on enrolling any other college at the moment. Olivia Jade is testing her mom Lori Loughlin‘s knowledge of 2017′s most popular slang terms! The beauty, fashion, and lifestyle vlogger posted her annual video of the lesson with her mom – who plays Becky Katsopolis on Fuller House – on her YouTube account. Olivia teaches her mom the meanings of various words, including “fire,” “thot,” “finesse,” “tea,” “smack,” “beef,” and more. 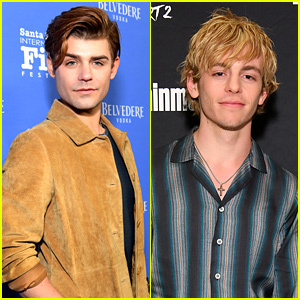 Ross Lynch & Courtney Eaton Enjoy Date Night at Dolce & Gabbana Party! Zendaya looks gorgeous at the Dolce & Gabbana party! The 20-year-old Spider-Man: Homecoming actress was joined at the party by fellow Disney star Ross Lynch and his girlfriend Courtney Eaton. Other stars spotted at the event were Ireland Baldwin, Jhene Aiko, Stallone sisters Sistine and Sophia, Olivia Holt, Pixie Lott, and Lori Loughlin with her daughters Olivia and Isabella.